Q?Can you tell me a little more about the RhythmRing? RhythmRings are made from high-strength polycarbonate, with a patented design that ensures a secure fit & extra comfort. The RhythmRing is 1″ round and 1.5″ long, and the elastic finger strap fits all finger sizes (very small hands can use 2 fingers in the strap). Q?Has RhythmRing won any awards? As a matter of fact, RhythmRing won the “Best in Show, Small Products” award at NAMM 2010! Q?My RhythmRing is a little snug… what can I do? If your new RhythmRing is too snug, just pull on the strap a bit to help loosen it up. Regular play over time will also do the job. Q?Are RhythmRings safe for children to use? Yes, children ages 3 and up are able to play with the RhythmRing, but we do recommend that you keep it away from children under 3 years of age because of the small parts inside it. 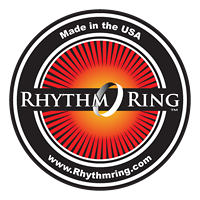 RhythmRing is proud to say we’re non-toxic and made in the USA!